History has not been kind to the flight scarf. While several thousand unique designs were produced – and some are still being manufactured – there is little public evidence they exist, let alone, were commonly worn. Only a handful of scarves are known to appear in flight equipment displays in aviation museums. You are most likely to see a scarf, and then only sparingly, in period photographs. They appear as an enigmatic swatch of color under the collar of an otherwise drab flight suit. Flight scarves have been a part of air force history since the dawn of aviation. Modern flight scarves are descended from the silk scarves that early aviators wore when they flew in open cockpits. Early military pilots liked them because the prevented chafing around the neck. A pilot’s head is on a swivel! During World War II and the Korean War, plain silk scarves were issued and some custom scarves were produced on a local basis, predominately in the Far East. Mass manufactured scarves became common after the Vietnam War era. At the same time, more complex design elements were introduced and scarves became increasingly popular items of unit pride and identity. In 1974, Rama World, Inc, a California company, began producing custom scarves and further popularized their use in units around the world. This company produced the vast majority of modern flight scarves. Other manufacturers included Corporate Logos, Inc. (USA), Screen King, Inc. (USA), OAR Products (USA), Aeroemblem (USA), Sir Christopher Hatton (USA), Designs by Anthony (USA), Flight Suits Ltd/Gibson & Barnes (USA), Aero Scarf Works (USA), Loreman's (USA), Ace Novelty Company (Japan), Alec Brook (UK), Jamy Ltd (UK), Bill Brooks Squadron Supplies (UK) and Terrane Ltd (UK). There were also many unknown local manufacturers. Today, hardly anyone collects flight scarves and even fewer people can accurately identify one. Consequently, flight scarves are arguably the most misidentified, misunderstood and rare of USAF militaria. This is for a number of reasons. Since primarily aircrew wore scarves, fewer were produced than patches, which were also worn by non-flying personnel. Scarves were also relatively expensive. Few were issued and they were far less likely to be given away than patches. Much of the knowledge base that we have today about unit patches and flight equipment is due to the interest of non-flyers. While patches were readily visible; scarves could only be glimpsed under the collar of a flight suit. Generally aircrew kept the scarves they were issued and rarely traded or acquired other examples. Since scarves were unit specific and purchased with unit funds, base history offices rarely documented or preserved them. Consequently, today flight scarves have virtually no recorded or institutional history. This website is part of a personal project to document and preserve the history of flight scarves. The vast majority of the over 2,000 scarves featured on this site are from my personal collection. I am presenting them, organized by air force base, as a work in progress. I just have a simple goal. I try to make this website better today than it was last week and know more about flight scarves tomorrow than I do today. My foremost interest is to see that these scarves are identified correctly. It is an understatement to say that this has been a challenge. The memories of both aircrew and collectors have faded over time. Incorrect guesses and erroneous identifications have been passed on further muddying the waters. I have worked closely with manufacturers, fellow collectors, and air force veterans to ensure that as many scarf designs as possible are accurately and credibly identified to a unit. In many instances, there is substantial research underlying the identifications on this website. I am also working to preserve the unique history associated with flight scarves. Scarves, by their very nature, provided a counterpoint to the uniformity of the Air Force. The USAF’s Cold War arsenal was dismantled in the 1990s and the further reduced in strength in the 21st Century. Much of the history and meaning behind the emblems, motifs, colors, and symbolism of iconic USAF units have not been recorded. Without action, it will be lost forever. In a many ways, flight scarves encapsulate the esprit de corps of units better than official emblems and aircraft liveries. Uncovering the meanings of the symbols and emblems of scarves has been one of the most rewarding aspects of my research. I not only believe that this is history worth saving, but also history worth sharing. I am in the process of synthesizing my research into a book about flight scarves. This is a legitimate and serious effort. I have twenty years experience as a professional researcher and writer. Any research assistance toward this project would be both valued and appreciated. Mark Anderton, Stevel Appel, Emil Balusek, Marcel Beisser, Patrick Blazek, Craig Brown, Lance Brown, Richard Burnett, Chris Charney, D.J. Currieri, Joe Conway, Sheri D’Ambrose, Hugo De Groote, Erik De Vries, Rex Downing, Lee Downer, Jed Dudek, Rachel Dudek, Jim Fagan, Jim Flaviani, Al Fushi, Jonathan George, Richard Giglio, Jim Gunn, Vicki Haas, Philip & Stacey Harbach, Peter Hall, Cameron Halbrook, Kevin Helm, K.C. Holston, Robert Hopper, Danny van Houttum, Andreas Hunold, Alan Johnson, Hank Johnson, Mark Jones, Mark D. Jones, Randall Jones, Russell Kowalski, Curt Lenz, David Lochiatto, Roel Lodder, Jack McFall, Jim McGibeny, John McNeil, Erwin Meier, Dale Messimer, Neil Miller, Gerry Morris, James O’Connell, Leo Perez, Tom Petruzzelli, Henk Pool, Jerry Polder, Marc Powell, Sven Rapreger, Bobby Renaud, Richard Romano, Christian Sabon, Jon Saunders, Larry Smith, Rodd Steele, Barry Stein, Robert Styger, Steve Szulczynski, Tony Taylor, Steve Towery, Randy Troutman, Marsha Turner, Jan-peter van Viegen, Rick Versteeg, Ian Warner, André Wilderdijk, Kurt Willson, Lee Winter, Wes Wittkopp, Walt Wright. My friend and collaborator in this effort, Leo Perez, passed away in 2013. When I first started collecting scarves, I began searching for more information about them. There was nothing out there. Somehow, I put together a search string that managed to find Leo's personal scarf collection that he had buried on a server. He used it so he could see what scarves he owned when bidding on eBay. Leo was the first scarf collector I met and we both commiserated on how little information there was about scarves. So, through our discussions, the website was born. I gratefully acknowledge the support and cooperation of Rama World, Inc.'s Jed Dudek, Sheri D'Ambrose, and Rachel Dudek. 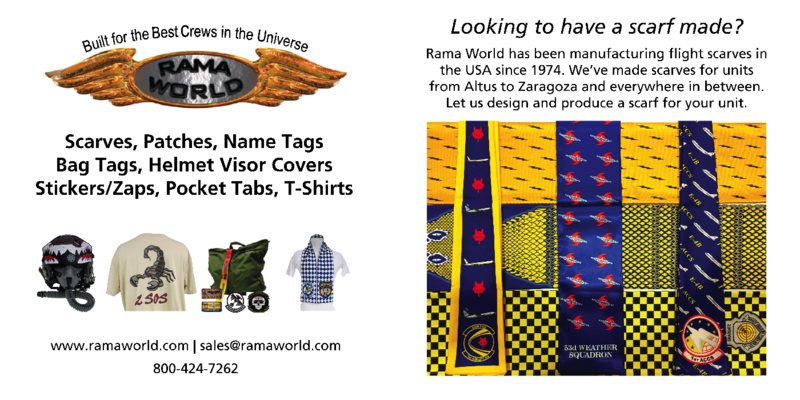 Besides supplying flight scarves to crews around the world, Rama World also manufactures leather and cloth name tags, patches, pen pocket tabs, bag tags, flags, and T-shirts. If you are a member of a military organization requiring any of these services, I enthusiastically recommend Rama World. Don't hesitate to give them a call. USAF Flying Training Patches - The only website in the world dedicated to preserving Flying Training and Class Patch History and a great resource for clues in identifying training class scarves. Tex-Cen Trading Company - Military insignia business of Emil Balusek, a great patch collector and friend. Mark D. Jones Blog: Life, Love and the Human Condition - Mark D. Jones has an extensive blog about his life. He served in the USAF and included are photos of his flight scarves. It is a valuable documentation about what it was like to be a Cold War fighter pilot posted in Europe. Rakkel, Rakkél, Rama World, air force scarf, USAF scarf, aircrew scarf, aircrew scarves, custom pilot scarf, custom pilot scarves, flight scarf, squadron scarf, F-4 scarf, F-15 scarf, F-16 scarf, F-22 scarf, F-117 scarf, A-10 scarf, B-52 scarf, B-1 scarf, B-2 scarf, fighter scarf, bomber scarf, U-2 scarf, SR-71 scarf, pilot ascot, squadron ascot, F-4G scarf, RF-4C scarf, Korean War scarf, US Air Force scarf, RAF pilot scarf, NATO Tiger Meet scarf, NATO Tiger scarf, pilot schal, luftwaffe schal, luchtmacht sjaal, pilot-sjaal, echarpe pilotes, air force écharpe, de la fuerza aérea bufanda, piloto de la bufanda.